Wouldn't you want to start every morning like this...or just one? Imagine this. It’s 6AM and the sun is just beginning to rise. The only sounds that can be heard are those of seagulls peacefully chirping and the rhythmic crashing of waves. 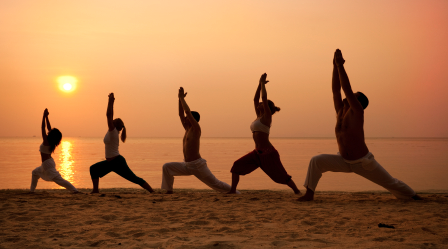 Instead of sleeping away this beautiful morning in Goa, you are out on the beach, feeling the grainy sand between your toes and practicing yoga. You are being guided through your practice by a certified and experienced yoga instructor in a 90-minute class. Afterwards, you are served fresh juice and a healthy, local breakfast to help you kick off your day. We wish we could start every morning like this…or even just one. “Like” this post if you agree!